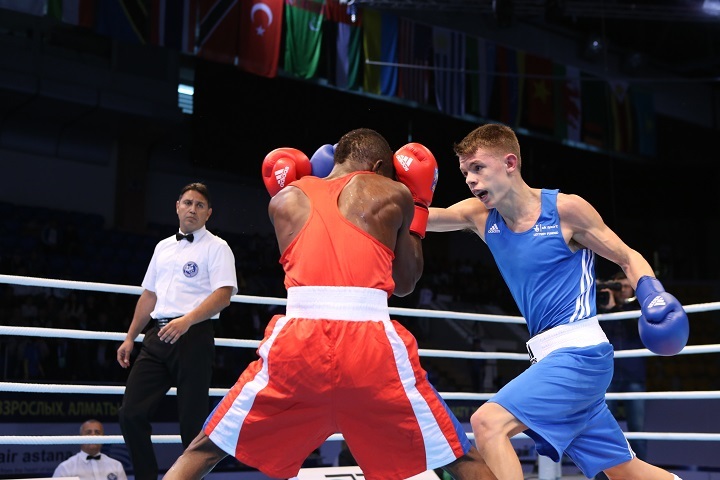 The 2013 AIBA World Boxing Championships kicked off today in Almaty, Kazakhstan with the Flyweights (52kg) and the Heavyweights (91kg) taking to the ring. Team USA boxer Malik Jackson and his Angolan opponent Vivaldo Rodrigues opened the event with the American athlete making short work of his African counterpart, twice knocking the African down and earning a TKO victory in the 2nd round. With vocal US support in the crowd cheering him it was a good start for the US team. However, it was another African who proved to be the surprise package of the session as Efetobor Apochi of Nigeria cut through his Turkish opponent at Heavyweight (90kg). Check out the "One to watch" section below for more details. Alexandre Riscan (Moldova) who fought for the Ukraine Otamans in the season deciding tiebreaker match in last year's World Series of Boxing (WSB) Team Finals, seems to have banished the ghosts of that defeat and looked good against AIBA Indian boxer Medan Lai. The southpaw demonstrated good foot work and landed some solid shots, particularly his right hook and left shovel punch. He didn't have it all his own way however, with his Indian opponent bringing the fight to the WSB star in confident fashion throughout the contest. Nonetheless the Moldovan landed the more telling blows to win the bout. Croatian Heavyweight Marko Calic who fought for the USA Knockouts last season looked extremely sharp as he came to the ring, giving his Australian opponent Jason Whatleley a standing eight count in the first minute and a half of the opening round. Using fluid foot work to stay on the outside and circle his opponent the Croatian never really looked in serious danger for the rest of the bout as he navigated his way to a comfortable win (3:0). Heavyweight Nigerian Apochi, won the crowds over with his performance this afternoon. Though initially looking out gunned by his taller Turkish opponent Seyda Keser, the African boxer unleashed a storm of hooks which dropped his larger opponent and opened a cut above his left eye. Seeming to burst in flurries before recovering the African is clearly an explosive style of fighter and though his technique may not be the most refined he defninately has the heart and power to cause anyone a problem this year. "First I want to thank god for making it happen", said Apochi. "I was under a little bit of pressure from him. He was composed and a good boxer, I'm not going to lie about that, but then again everyone here is a good boxer. Last night I watched a video of him on Youtube, he was a bit better in real life than what I saw of him yesterday. I think that actually he had an improved performance today compared to the bouts I saw on the internet but I was still confident that I could beat him. I felt relaxed and I know I have a good guard. I came out and I gave him a right hand that dropped him. After that he wasn't himself anymore and the bout changed. I could see looking in his eyes that he was scared of me after I knocked him down. I think in the next fight I will come out well, now that the pressure of the first bout is off". In the Flyweights, England's Edwards also looked good, taking the centre of the ring and twice knocking down his Nigerian Opponent Yusuff Olayinka to take the bout comfortably at 3:0. Edward's coach David Alloway said "it's nice to get the first one out of the way, normally African countries are very strong, they are emerging nations, but Charlie handled the pressure well. We've been out here for elven days preparing for this and it's nice to start with a win".